Successfully Added AGM X2 Rugged Android Phone - Android 7.1, Octa-Core CPU, 6GB RAM, 128GB ROM, 5.5-Inch FHD, IP68, Dual-IMEI, 4G to your Shopping Cart. Head out into the wild with the AGM X2 Rugged Android Phone. This stunning smartphone features a fully rugged IP68 design. Thanks to this, it is resistant to water, dust, and drops. You’ll be able to carry it along anywhere you go because even the toughest of environments won’t stop this Android device from working. Within its rugged body, the Android phone holds a stunning 5.5-Inch FHD display. This screen lets you enjoy all your favorite media in crisp 1080p resolutions. The phone comes packed with a whopping 6000mAh battery that brings enough juice to get you through the longest days of smartphone usage. This Android phone comes packed with a stunning 16MP front snapper. With this camera at your disposal, you’ll be able to shoot great selfies and video of your adventures. Additionally, it features a Dual-Lens 12MP rear camera. With this Android smartphone in your pocket, not a single special moment will pass by uncaptured. The phone treats you to 128GB internal memory. This is enough to store all your pictures, videos, games and media without needing to worry about running out of storage. For ultimate connectivity, your smartphone supports Dual-IMEI numbers and 4G. 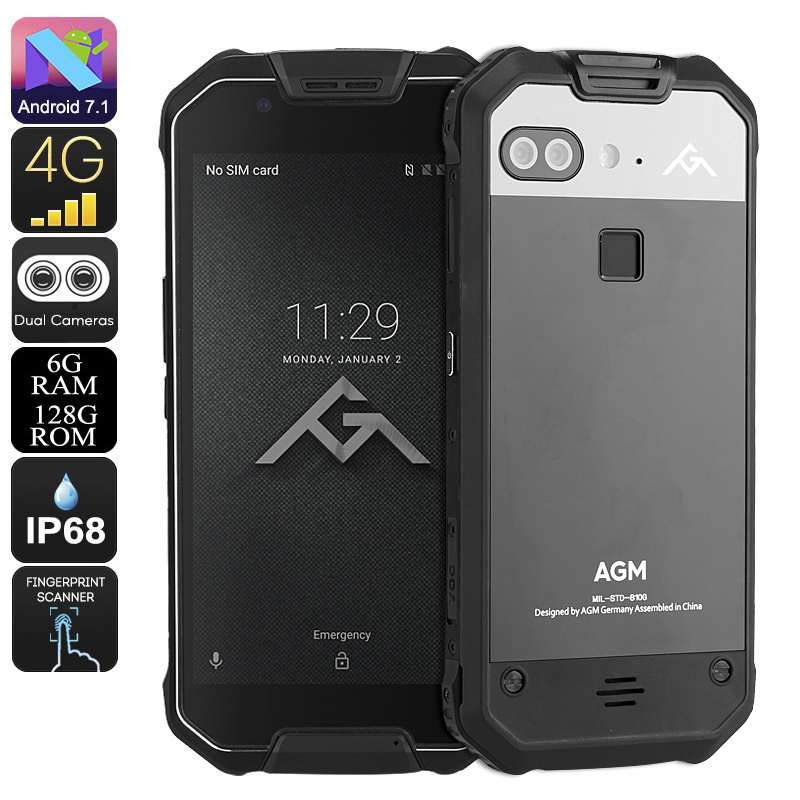 The AGM X2 Rugged phone runs on Android 7.1. This operating system lets you take advantage of all the latest software features while enjoying a smooth user experience. With respect to its hardware, the phone packs a powerful Octa-Core processor clocked at 1.95GHz. Additionally, it comes with 6GB of RAM. This provides you with all the power needed to tackle the most demanding software without dropping a frame. Whether you use your phone for playing games, browsing the web, of watching FHD films – nothing will slow this beauty down. The AGM X2 Rugged phone comes with a 12 months warranty, brought to you by the leader in electronic devices as well as wholesale smartphones..